​ DALLAS-FORT WORTH - From an online vendor of silver and gold to a company that makes it easier to order kids' sports gear, DFW companies are among the fastest-growing in the country. Fourteen local companies made the top 500 of this year's Inc. 5000, an annual list of the U.S.'s fastest-growing private companies. 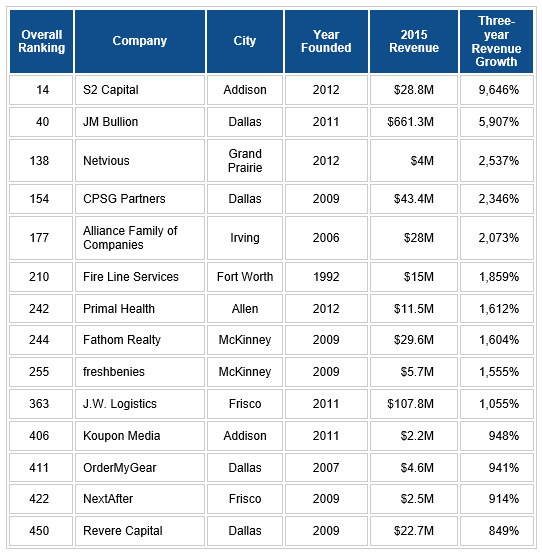 More than 100 Dallas-Fort Worth companies made the top 5,000. In the Dallas-Fort Worth area, the top honor went to S2 Capital. The Addison-based residential real estate company renovates and manages multifamily apartment complexes. It was founded in 2012 and has grown to 105 employees. It snagged the 14th spot overall.